It was a glorious day for the Ayitey Family as thousands of believers from all walks of life converged at the James McKeown Revival Centre at Asamankese in the Eastern on Sunday, August 19, 2018 to celebrate the climax of the 39-year successful ministry of Apostle Moses Ayitey. 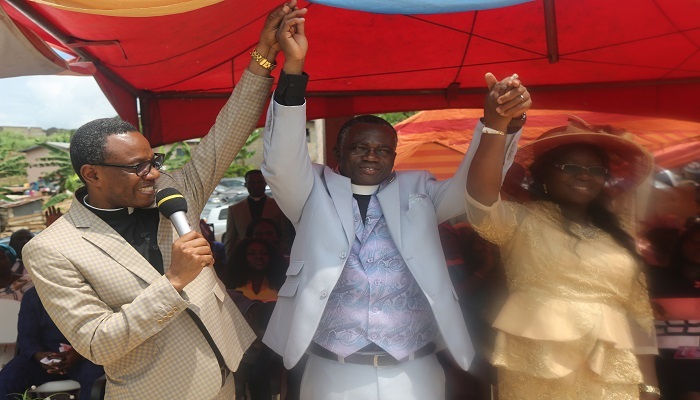 The retirement service which was officiated by the General Secretary of The Church of Pentecost, Apostle Alexander Nana Yaw Kumi-Larbi, was attended by the former Chairman of the Church, Apostle Dr. Michael Kwabena Ntumy and his wife Martha. Also present were several ministers of the Church and sister churches and some dignitaries, including Apostle Joseph Assabil (Achimota Area Head and Executive Council Member), Apostle Dr. Daniel Okyere Walker (Rector of the Pentecost University College and Executive Council Member-elect), Apostle Dr. Amos Jimmy Markin (Evangelism Director) and Mrs. Grace Lucy Yeboah-Asuamah (Women’s Ministry Director). As part of the ceremony, several citations touting the outstanding ministry of Apostle Ayitey and his wife, Esther were presented to them by various groups. In a testimony, the General Council of the Church described him as a minister of integrity. 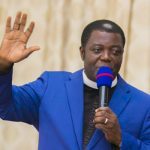 “As a product of the Pentecostal heritage, Apostle Ayitey would not countenance any adulteration of the Pentecostal structures of the Church, neither would he compromise on the policies of the Church. He was one person you could trust for integrity, faithfulness and dignity,” the testimony said. The Obuasi Area Head, Apostle Martin Seth Appiah, in a sermon on the topic: “The Lord Protects and Delivers those who Fear Him” (Psalm 34: 7-9; 25:12-14), revealed that the fear of God is the pivot around which all sound doctrines evolve. This is because it is the fear of God that enables the believer to obey God and follows His precepts, demonstrate love to others and live a righteous life, as outlined in Galatians 5:22-23. He explained that although righteous people may face many difficult situations in life, God always delivers them. Apostle M. S. Appiah touched on four key areas where Christians are required to exhibit the fear of God in order to make it to heaven. These are: the full-time pastoral ministry, church responsibilities, marriage and dealing with fellow believers. For him, the fact that one is a minister of God does not mean that he is qualified for heaven. “Many apostles, bishops, prophets and pastors of the universal church would miss heaven if they don’t amend their ways,” he cautioned. He also posited that many church leaders and officers do not fear God as they indulge themselves in distasteful acts like stealing of church money and sexual immorality. “They don’t fear God, and any person who doesn’t fear God should forget about heaven,” he said, while referring to Galatians 5:19-21. Concluding his sermon, Apostle M. S. Appiah identified seven benefits that are accrued by believers who fear the Lord as stipulated by King David: God’s angel encamps around them, they lack nothing, God shows them the path they should choose, they will spend their days in prosperity, their descendants will inherit the land, God confides in them and He makes His covenant known to them. Born on January 6, 1953 at Apesika near Adawso-Akwapim in the Eastern Region, Moses Kwadjo Ayitey, the second among eight siblings, had his basic education at Atebui L/A Primary School and completed at Adawso Presbyterian Middle School in 1973. Though he passed the Common Entrance examination to secondary school, he could not go due to financial challenges. On the recommendation of his former head teacher, he entered into apprenticeship training at Nkawkaw in 1975 and passed out successfully as an Auto Sprayer in 1978. After completing his apprenticeship, his master immediately employed him to work with him due to his hardworking nature. He worked with him for one year before he was called into the full-time ministry of The Church of Pentecost in 1979. He was called into the pastorate in 1985, appointed an Area Head in 2007 and later called into the office of Apostle in 2009. Throughout his 39 years of pastoral ministry, he ministered at various conventions and leadership retreats, and impacted many lives while serving at Hweehwee (1979 – 1986), Kpando (1986 – 1992), Dodowa (1992 – 1997), Asesewa (1997 – 1999), Somanya (1999 – 2004) and Accra New Town (2004 – 2007). He also served as an Area Head for Ho (2007 – 2013) and Asamankese (2013 – 2018). He is married to Esther Darkwaah Ansah Ayitey and are blessed with six children.